If you plan to visit one of the most romantic islands in Southeast Asia, you need to prepare for a perfect honeymoon. 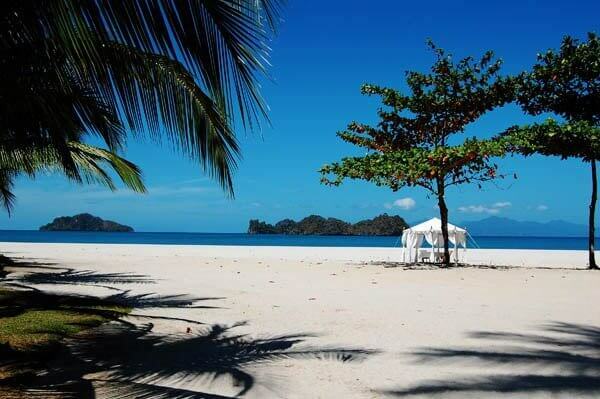 Langkawi has a warm year-round climate, with an average temperature of about 28 degrees Celsius. However, the best time to enjoy your honeymoon is cool, dry weather, during the dry season, which is October to March next year. The pier and Langkawi Airport have many information booths providing information about the hotel, tours, car rental, etc. You can experience by renting self-drive cars, taxi ride by km, Or follow the trails to explore waterfalls, lakes and primeval forest scenery. Motorcycle rents range from RM 35 / day, car rent from RM180 / day. If you do not have much experience, take a taxi to ensure safety. Couples can save an amount for romantic accommodations that are suitable for a young couple's honeymoon, to enjoy private space and high-end services. Some of the top 5-star hotels in Langkawi like The Danna with infinity pool overlooking beautiful beach, Andaman Resort are designed in royal style, the villas have swimming pool and private beach, Meritus Pelangi Beach Resort & Spa with a system of rooms designed entirely from wood close to nature; Four Season Hotel & Resort, topped by the best resort in Langkawi with its own emerald blue beach and rooms, bungalows are furnished with delicate décor. If you want to save money, you can find more affordable hotels and resorts near Pantai Cenang, the most crowded place on the island. In the high season or weekend, the island attracts a lot of visitors, so it needs to be more active and secure (payment by visa card). 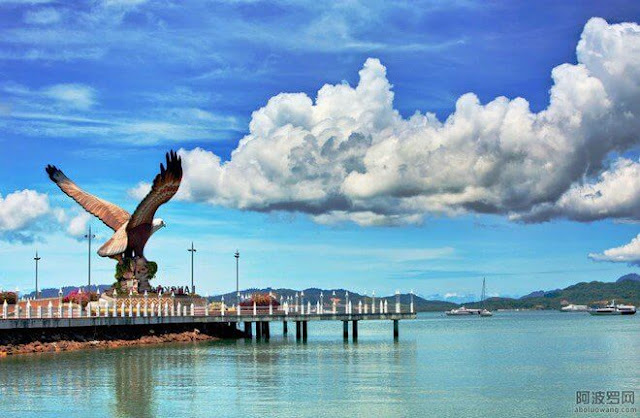 Langkawi consists of 99 islands, 478.48 km² in area, attracting tourists by the two most crowded areas of Kuah Town, where the pier and Pantai Cenang beach have Langkawi Airport. At the Kuah Ferry, the highlight is the 12-meter-high eagle, spreading wide as welcoming bustling tourists to visit the island. This is also the ideal place for couples to enjoy the most romantic sunset. An indispensable highlight is Oriental Village, a complex of hotels, trade centers, entertainment centers located deep in the mountains. Here, you will experience the cable car cable car to take visitors to the observation tower on the top of the mountain to see the majestic mountains and panoramic Kuah Bay with the beautiful sailboat below. Then experience the adventure of walking on the Sky Bridge, 700 meters above sea level, with a unique 125m arc-shaped design that links the Mat Cincang Mountain and nearby mountain. From here, you will be surprised by the panoramic view of Langkawi at your feet. The current two-leg ticket price is RM35 per adult, and the ticket for Sky Bridge is now RM5, after upgrading to RM17. Some other sightseeing tours that tourists choose to visit Eagle Island are birds and eagles. Often at a cost of RM30 / person for a 4 hour boat ride, you will arrive at Pulau Singa Besar (Lion Island). Or from Pantai Cenang and Pantai Tengah, you can buy a sightseeing tour and bathe in a unique lake called Pregnant Maiden Lake, surrounded by mountains in the middle of the sea. You can also take part in scuba diving tours, visit the geological park with lakes created from lime pits thousands of years ago. In the evening, many couples stroll along Cenang Beach, stopping in front of the bar, sipping cocktails, local drinks, and enjoying the crowded atmosphere. You should try a lot of traditional Malaysian dishes at Pantai Cenang and Pantai Tengah. Some typical dishes like Nasi Lemak aromatic coconut rice, noodles Penang Assam Laksa ranked seventh in the list of 50 best food in the world; Barbecue satay - famous street food in Malaysia, Char Kuey Teow; Rojak salad dressing; Roti Canal ... A good suggestion for you to experience is the Fish Farm restaurant, serving a variety of European and Asian dishes and especially traditional Malaysian dishes. The beautiful island of Langkawi also attracts shoppers, because all the goods are tax-free. Household products, perfume, chocolate, beer, cigarettes and cigars are 30-50% cheaper than Kuala Lumpur stores. Shops on the island are usually open from 10-22 hours.